A great beachside apartment, southerly facing, looking out over Woolacombe bay across to Baggy Point to the south and Lundy Island to the west. It takes just a few minutes to walk to the steps down to Combesgate beach or up to the coastal path leading to Morte Point. There is one car parking space to the rear of the property. Entrance to the apartment is via the private patio at the front and seaside of the apartment. This is reached via a flight of steps from the car park. 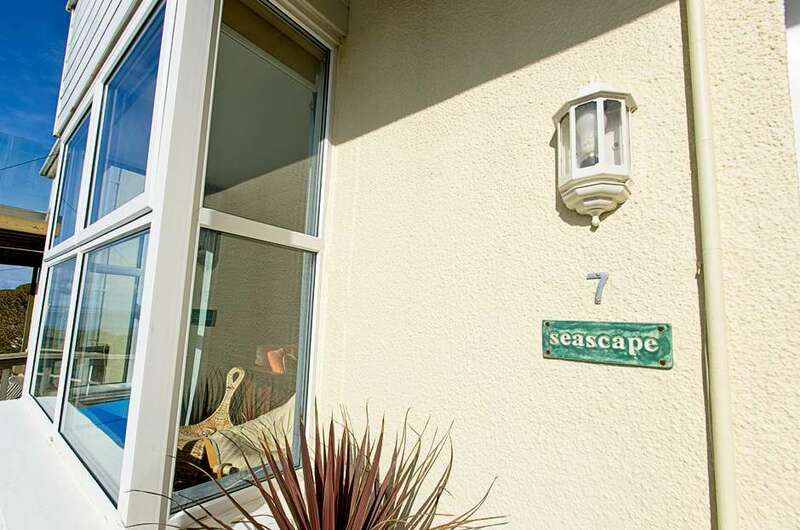 Seascape has two bedrooms (one twin and one with king size bed) and sleeps 4. There is a lobby for coats and shoes leading straight into the dining area of the open plan living room and kitchen. This room is wonderfully sunny and bright with marvellous views across the bay. This room and the patio are great places to watch the amazing sunsets. Tasteful and stylish décor with washed wood flooring, sumptuous grey fabric sofas and contrasting turquoise soft furnishings bring this contemporary room to life. TV, DVD, HiFi, DVDs some games and books are all thoughtfully provided. The property also has Wi-Fi. The oak kitchen is equipped with full size dishwasher, washing machine, 50/50 fridge freezer and micro wave, oven and hob. The two bedrooms are to the rear and are neat, clean, fresh and white both have wall mounted flat screen TVs. The family bathroom is modern and quite spacious with white suite with bath and separate shower, wash basin and WC. There is a back door from the twin bedroom to an enclosed private enclosed courtyard outdoor area where surf boards, wet suits and towels etc can be dried. Wetsuits can also be hung on the purpose-built rail at the front of the property although not over the railings as this is a conservation area. Travel cot and high chair provided. In easy reach of beaches, coastal walks, local bars and restaurants, this fresh, light and modern apartment makes a superb holiday property providing comfort, luxury and practicality whilst enjoying one of the best locations in the surrounding area. Up to 2 dogs are accepted at no extra charge.